Adidas, I am a fan, so I write to you out of love. I grew up with your stripes on my feet singing Run DMC's "My Adidas!" I am also an environmental attorney with an expertise in plastic pollution, so I write to you out of my concern for the oceans. You have partnered with Parlay for the Oceans to make a statement about Marine Plastic Pollution, but I am concerned that you are not fulfilling both halves of the equation of another Run DMC classic, featuring Aerosmith: "Walk This Way". In fact I believe you are talking about stopping plastic pollution, but acting in a way that creates it. Though touted in the press as being a solution to plastic pollution, your shoe using reclaimed fishing nets as a topical design element is not a solution, and is not even for sale! It's a prototype. The publicity claiming that the shoe is "made entirely from ocean plastic trash" is confusing to your average consumer and may persuade them to believe they can keep on using single use plastics because now the plastic has a place to GO: Oh, it will be a shoe. Not so. This marketing image for the shoes you are actually selling shows the truth: Your shoes are made from virgin plastic. We are producing more and more single use plastic every year, and much of it is ending up in the environment. This plastic in our environment has entered our food chain as even plankton are consuming microplastics from our disposable and toxic culture. Glamorous projects like your prototype shoe, or even Parlay's collaboration with G-Star Raw jeans incorporating plastic yarn from plastic bottles, will not change that fact. Closed loop recycling, producer responsibility, and using better materials for single use products and packaging will solve the problem. But that is cutting fossil fuels out of the picture, and fossil fuels have enormous power and are extremely cheap because we are externalizing the cost of the environmental damage they cause. Hardly anyone wants to recycle plastic in a closed loop design, product to same product, because the virgin stuff is so cheap. There is a glut of natural gas thanks to tar sands extraction, off shore drilling and fracking. And the toll on our climate, air and water is deadly. Soon there may be no more clean water left to go in those fossil fuel plastic bottles! "They won't be using the tiny fragments of plastic that swirl, soup-like, in places like the Pacific Gyre... If you want to take it out of the ocean, you can trawl for days and days and get a tiny spoonful of plastic," Gutsch says. "At this point we didn't see a feasible technology. What we believe now is that you can instead avoid the microplastic that's coming into the system." 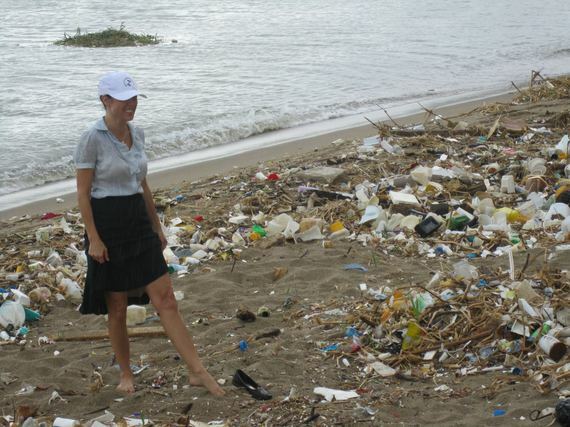 The oceans are filled with plastic: 95 percent of it is smaller than a grain of rice. We need to turn of the tap and stop making plastic stuff from fossil fuels that get into our environment during their entire life cycle from extracting the fossil fuels to end of life when almost all plastics last forever in a dump, get burned creating dioxins, or get lost at sea. We need producer responsibility, not green/brainwashing. There are companies that are really doing something to stop plastic pollution, not trying to make a buck with greenwashing. Take Note of Nike's policy to take back and reuse its shoes and in the UK, Selfridges just stopped selling plastic water bottles. Now those are real solutions. Walking the talk! It's time for real solutions that change the model of business, not plastic bandaids applied to business as usual in order fool the public. We aren't fooled. No more waiting on the change. Adidas, I call on you to Be the change.